Dr. Ali Sepehr contrasts endoscopic brow lift surgery with non-surgical facial rejuvenation, revealing the potential benefits and limitations of each procedure. Irvine, CA—Subtlety should be one of the primary goals for any plastic surgeon performing facial rejuvenation procedures, states Ali Sepehr, MD, a facial plastic surgeon in Irvine. He believes that developing a customized treatment plan, particularly when a patient is considering a surgical brow lift or a non-surgical Liquid Facelift, will be necessary to achieve the best possible outcome. The appropriate technique, he continues, will depend on the individual’s unique anatomical indicators, expressed goals, and amount of available downtime. He also notes that each method can offer abundant benefits for the right candidate, and having a well rounded understanding of what to expect from each technique can help people make better informed decisions about their treatment. Before arriving for an initial consultation, many patients believe they know which cosmetic treatment they want, Dr. Sepehr explains; however, determining the right brow lift procedure requires a physical examination as well as an assessment of the expectations of the individual. If someone arrives with significant skin laxity, a desire for long-lasting effects, and a reasonably open schedule, the Irvine facial plastic surgeon says he typically will recommend an endoscopic brow lift, which can offer more effective results than non-surgical options while still offering a minimally invasive technique. Skin laxity cannot be addressed with dermal fillers and BOTOX® Cosmetic, he explains, and these methods actually can worsen the sagging effect. A Liquid Facelift can provide numerous benefits for qualified patients with mild to moderate forehead creases, crow’s feet, and youthful volume loss on the upper face, he notes. Furthermore, he suggests this highly customizable approach potentially can help to delay the need for a more invasive cosmetic operation. 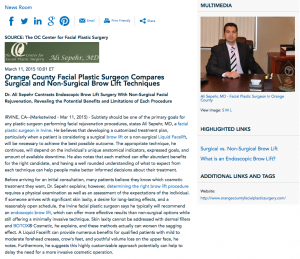 Ultimately, Dr. Sepehr says he strives to provide a helpful resource on the benefits, limitations, and risks of popular brow lift procedures to assist patients in their decision-making process. Many individuals report delight at finding out that a non-surgical treatment may achieve their desired outcome, while others appreciate the comprehensive approach and advanced surgical techniques that can be used to optimize the effects, he indicates. The most important decision, he emphasizes, will be to select a board-certified facial plastic surgeon who will customize a treatment plan tailored to suit the individual needs of the person. Dr. Sepehr is a fellowship trained facial plastic surgeon located in Irvine, California. He received his undergraduate and medical degree from the University of California, Los Angeles before completing additional training at the University of California, Irvin in Head and Neck Surgery and Facial Plastic and Reconstructive Surgery. A member of the Academy of Facial Plastic and Reconstructive Surgeons and the American Academy of Otolaryngology—Head and Neck Surgery, he is also the recipient of numerous accolades, including the Reuther Kris Conrad Merit Award in 2010. Dr. Sepehr is available for interview upon request.